A solemn Mass in the Mozarabic Rite will be celebrated in the Roman Basilica of the Holy Cross ‘in Jerusalem’ (Santa Croce in Gerusalemme), on Friday, May 6th, starting at 6 p.m. The main celebrant will be Father Salvador Aguilera Lopez of the Congregation for Divine Worship, a priest of the arcdiocese of Toledo; the Knights and Dames of the Equestrian Order of the Holy Sepulcher, who have a regular Mass in the Basilica each first Friday, will be present. The Mass will be in Latin, and the Mozarabic chants will be sung by the cantors of the Pontifical Institute for Sacred Music. The Mass of the Finding of the Cross will be said, transferred from Tuesday the 3rd, an appropriate choice for the Basilica where the relics of the True Cross are still kept and venerated. 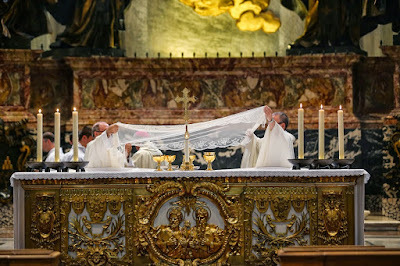 The veiling of the ciboria and chalices during a Mozarabic Mass celebrated last year in St Peter’s Basilica.